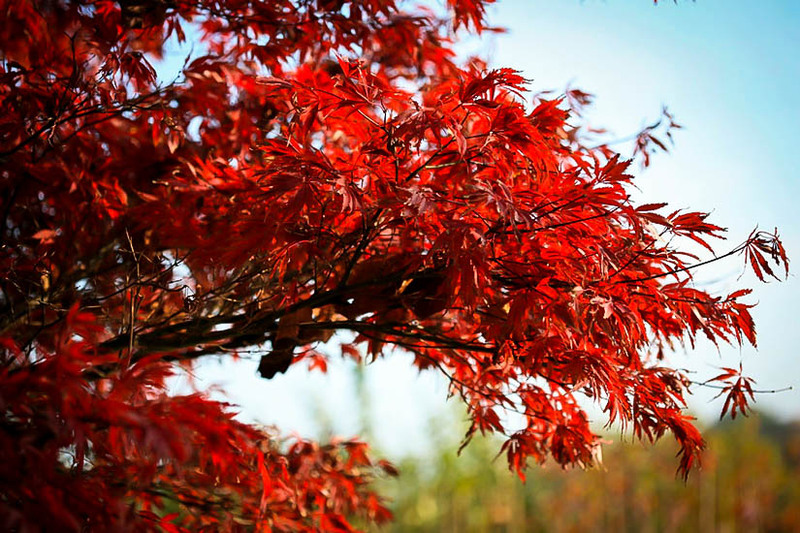 Avoid the typical summer fading of common red-leaved Japanese Maples with Sherwood Flame, outstanding not only for holding its rich burgundy color all summer, but also for a brilliant fall display of scarlet leaves. A key feature too are the clusters of tiny red ‘maple-keys’ that festoon the branches in early winter – an added feature absent from most Japanese Maples. Small branches covered with characteristic star-shaped leaves, give this small tree a strong yet elegant visual appeal that surpasses any other tree in its class. 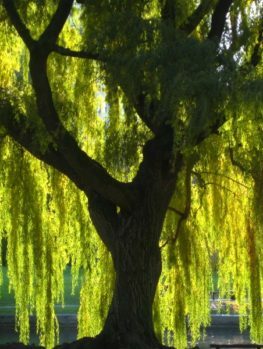 The branches form low on the trunk of the Sherwood Flame; as the tree matures it develops a rounded figure with a graceful spread. Shade tolerant too, making this the ideal tree for a smaller garden, bringing great beauty without crowding your limited space. A good tree for a large planter too, thriving for years and growing in beauty. 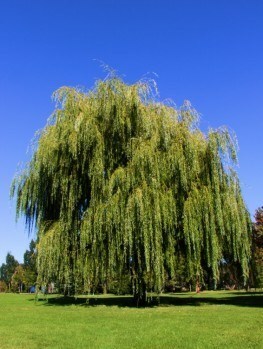 An ancient Chinese proverb says, “The best time to plant a tree was 20 years ago. 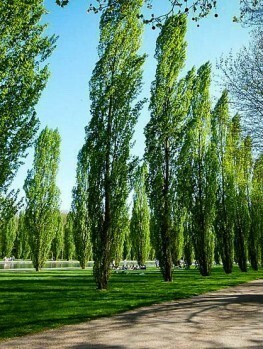 The second-best time is now.” When you add trees to your garden you are not only adding beauty and helping the environment but also increasing the value of your home. By planning a well thought out, low maintenance landscape design, and using plants that offer stunning color displays as well as contrast to the surrounding terrain, you can increase the value of your property by up to 20%. 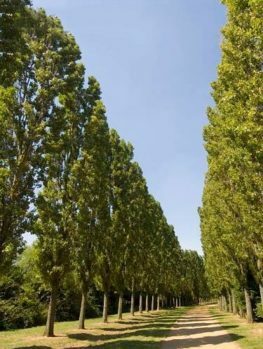 There are also many environmental benefits in planting trees; their large root systems can reduce soil erosion, foliage offers shade to your home which in turn helps reduce cooling costs in the summer months, and many species will attract and sustain a whole range of wildlife. The Sherwood Flame is a stunning example of the Maple tree. Its bright colors, unique leaves and the broad crown of foliage make it a sight to behold. Wherever you decide to use this example in your landscape design, it is sure to be a head turner. It is definitely a tree that will not go unnoticed! 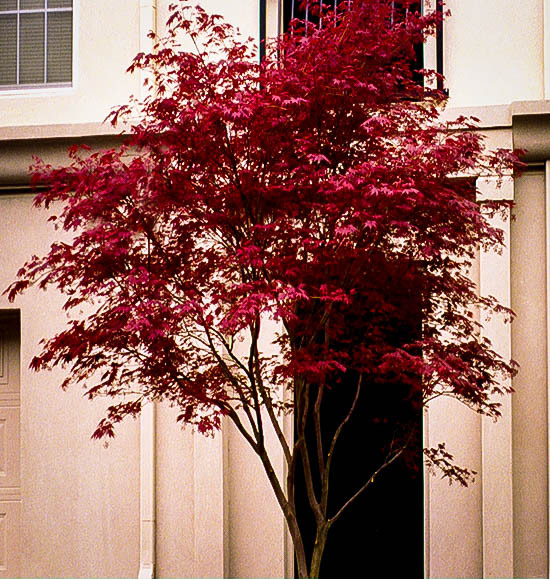 The Japanese Maple is hardy enough to suit locations in USDA plant hardiness zones 5 through 8 and can be found through the upper Midwestern United States, then down into the upper portions of Georgia and Texas. Even though it is capable of thriving in the hotter states you will want to make sure to avoid hot dry locations and offer it some protection from strong winds. Sherwood Flame will require an adequate watering schedule if you plant it in a location that does not receive regular rainfall. 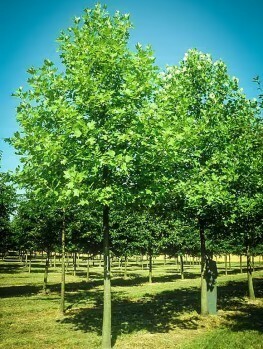 While this Maple is highly adaptable to its surroundings, ensuring that you are planting the tree in soil that it prefers will make growing this tree much easier. It loves moist and organically rich soil that is slightly acidic. It thrives best in sandy loams. 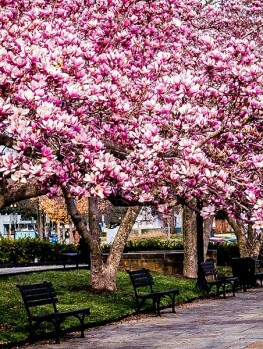 While this tree prefers soil with adequate water content, it will need to be well-drained to prevent root rot. You will also want to make sure to plant the Sherwood Flame in a location that receives most of the day’s sunlight. While it does tolerate part time shade, the best colors are displayed when the tree receives the most sun. 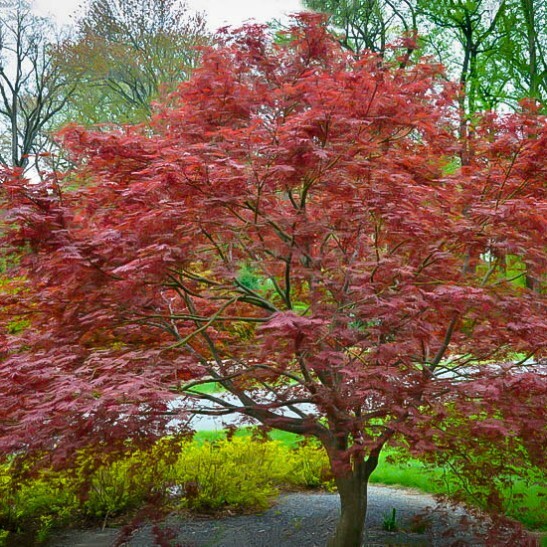 Caring for the Japanese Maple is also pretty easy – even for the most novice of horticulturists. Fertilization is most appropriate in the spring time just before the new leaves emerge. This will help new growth thrive and also allow the tree to produce more vibrant coloring later on. Pruning for this tree should be kept to the very minimum possible and should only be done in the late fall to mid-winter months. Because this is a variety of maple, the tree is capable of producing profuse amounts of sap and if you prune the tree during spring or summer it will bleed heavily. This variety is free of any major insect or disease problems but there are still some things to watch out for, like stem cankers, leaf spots and root rot. All of this can be dealt with if it’s detected early, which will save both you and your tree a lot of stress. 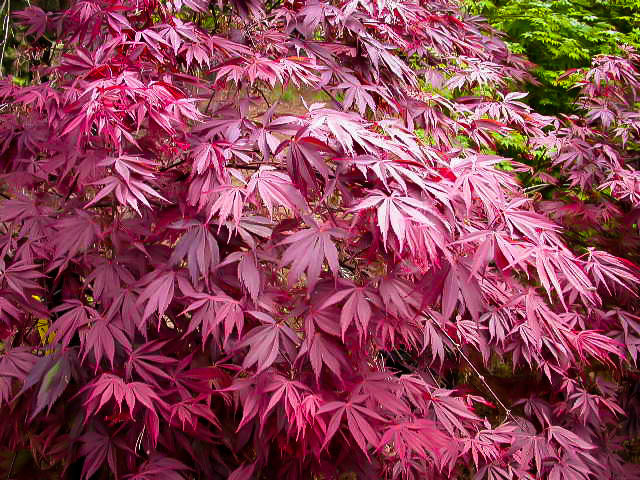 The Sherwood Flame variety of the Japanese Maple tree is native to locations throughout Japan, Korea, and China. It has been widely cultivated since the first specimen arrived in England in 1820. 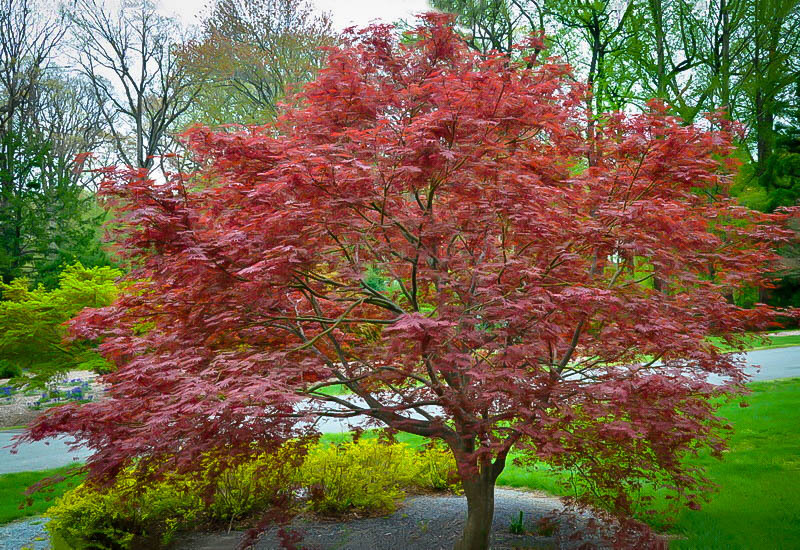 Carl Peter Thunburg, a Swedish born doctor and botanist, traveled to Japan in the late 1800s and gave the tree the biological name Palmatum, which describes the hand-like appearance of its leaves. This particular species can grow up to 16 feet tall and have a width of 14 feet. The branches form low to the ground on a single trunk and, as the tree matures, it begins to form a dense crown filled with beautiful foliage. Even though the Sherwood Flame is a deciduous tree, it provides color interest all year round. 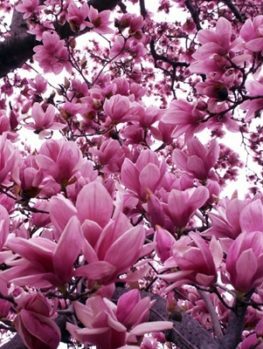 In the spring, newly formed green leaves make for a bright show; these turn a deep purplish red as autumn approaches and then a spectacular cherry red color. It also displays an array of oranges and yellow colors during the fall months. The leaves often present themselves in a splayed shape which can resemble an open hand or the points of a star. They can present in odd numbers of five and seven points. Occasionally you may even find a nine-pointed leaf. However, changing leaf colors aren’t the only thing this busy tree has going on. In April tiny flowers begin to bloom. While they are unremarkable at a distance, when seen close up they are quite attractive. The Japanese Maple also produces samaras, tiny winged fruits that you may have called “helicopters” as a young child. When these small fruits are thrown into the air or are falling from the tree, they spin like tiny little helicopters.